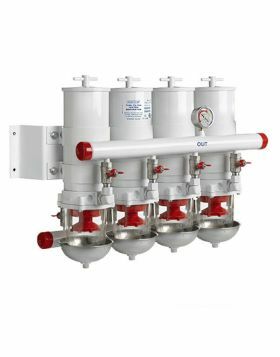 Centrifugal filters with maximum capacities from 720 up to 3600 litres/hr. 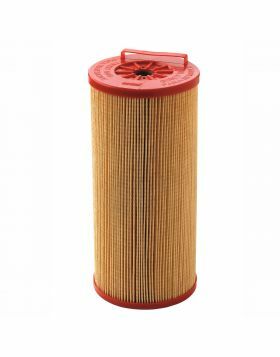 Fuel filters separate moisture and dirt from the fuel, after which the clean fuel is directed to the engine. 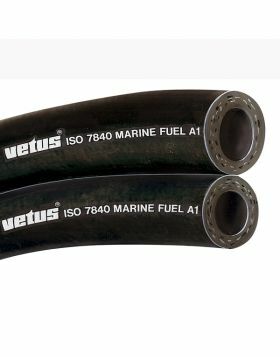 VETUS centrifugal fuel filters are based on a patented fuel flow system in which w ater and large solids are separated by means of the centrifugal seperator before the fuel flows through the filter element. Subsequently the fuel flows from the outside in through the filter element which removes suspended w ater and small particles. This reversed flow direction increases the effective filtering surface compared with conventional filters. The combination of these tw o unique techniques results in consistent filtering and a longer lifetime for the filter elements! 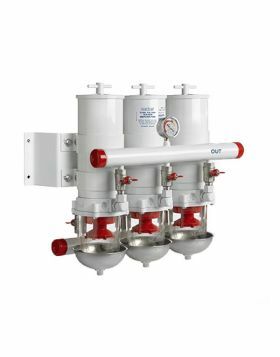 All VETUS centrifugal filters are CE, ABYC and Germanische Lloyd certified which makes them applicable for commercial vessels. This modular system may be ordered in combinations of 2 to 6 filters for engines of up to 5000 hp. 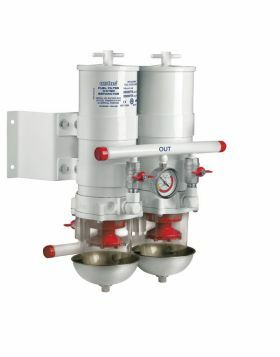 The fuel inlet and outlet can be configured on the same side or opposite sides, depending on the installation requirements.